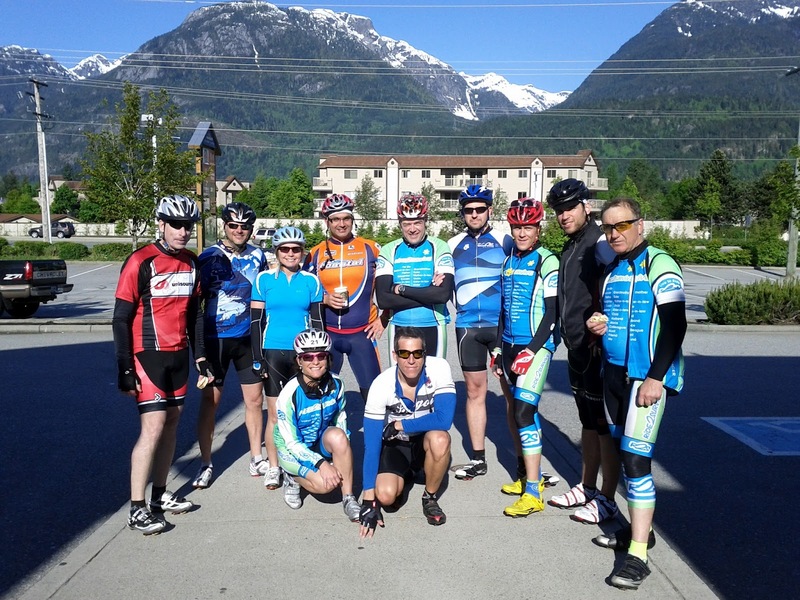 With only 4 weeks to go until we ride 380 km from Kelowna to Delta with the Ride2Survive in support of the Canadian Cancer Society, a few of us decided to go on an unofficial training ride. You see, no official ride was scheduled for this weekend and the last fully organized long group ride is a 200 km ride next weekend. 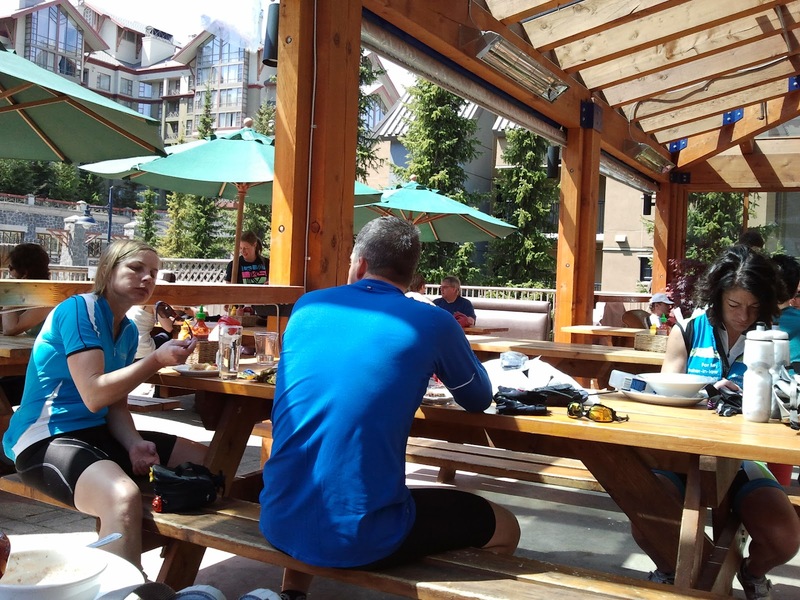 Unfortunately some of us cannot make it next weekend and so we decided to organize a small group to ride up to Whistler from downtown Vancouver and back after a short lunch stop. 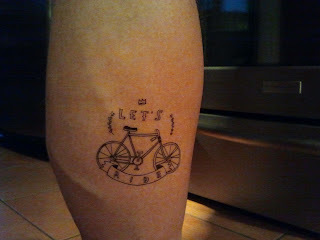 This neat adventure calls for a neat Tattly! The small group turned out to be 11 and the weather gods liked our endeavor and graced us with a spectacular sunny and nice day. So we set off at just after 5:00 AM from downtown, went straight up the Stanley Park Causeway and over the Lions Gate Bridge into West Vancouver. With virtually no traffic at that time taking Marine Drive to Horseshoe Bay was already an incredibly uplifting start of what promised to become a wonderful day of riding and training. Most of us had at this time some good amount of training - including hills - in out legs but going a total of 250km was still quite a bit more than any of us had done this season yet. So we went at a steady but quite manageable pace along the Sea-to-Sky Highway until our first planned stop at the Porteau Cove Campground. After a short rest we continued on with what we knew was going to be a shorter segment to the next stop at the Starbucks in Squamish. Another water refill, pee break, and leg stretch here and off we were again. 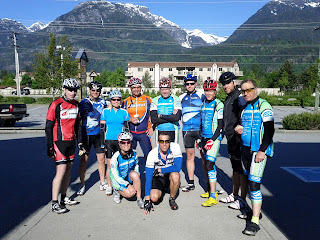 While the 70 km until here were somewhat undulating, we all knew that the next 55 km to Whistler is where the hills are! Also along that stretch are not that many places to refill water bottles so we were settling in for a good workout. At the next stop at the Brandywine Falls rest we knew we had most of the "big hills" behind us and are less than an hour away from Whistler and our - well deserved! - lunch stop. Turns out that there is no readily available water available at Brandywine Falls so being close to Whistler was a good thing. With some sharing of spare water around the group we all managed to have enough though. 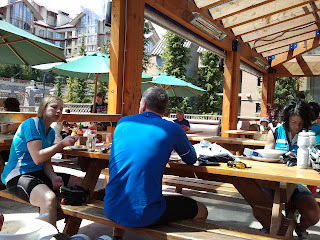 Lunch in Whistler was lovely and the rest quite welcome. In the end we stayed for an hour which was probably longer than we planned but the patio was soo nice and sunny! On the way back we decided to go pretty much at out own speed until we all meet again at the Starbucks in Squamish. This way we got to enjoy the downhills at out own individual comfort levels and have some fun along the way. From Squamish we decided to stay a bit more together, or rather to wait-up and re-group more often as some separation was inevitable. The next "planned" rest stop was the Gleneagles Community Centre in West Vancouver - near Horseshoe Bay. At a re-group stop near Shannon Falls, just as we were soaking in the rays, I made the cardinal mistake... I wondered aloud if the other group may have had a... and here I used the "m"-word we so carefully avoided the entire ride until now. "Do you think they had a mechanical?" I asked. OH CURSE ME! No sooner had I said this... BOOM! I know my front tube just blew. Still I had to look around in the hope that it was someone else's. No? Oh damn! But hey, I am a triathlete and changing a tire is not going to take much time. The others came around just as I was fitting the new tube and they decided to keep going as we probably are going to catch up with them anyway. Tube in and CO2 attached and phhuuuuuuuuuu - half the CO2 goes into the air. Dang. OK, let;s try Steve's inflator. Works well and another CO2 canister goes into the tube. Now just quickly cleaning up and off we are. BOOM! OH COME ON! "Did you check the tire?" Steve asks. "Err, no...." But it wasn't the tire, it was the extra air I am sure. OK-let's-do-this-again-and-hurry-as-we-are-now-way-behind! Hurry I did and as soon as I let the CO2 inflate the tire.... you guessed it: BOOM! This time I rushed and didn't check that the tube was properly set. Now it's just a gong-show. Thankfully I brought 3 (three!) spare tubes! I am now on the last one... Now Steve is showing merci and is actually changing the tube for me. But-no-CO2-thank-you-very-much! Someone give me a pump please. Finally after about 25 min we were riding again. Catching up with the other group is now all but impossible. But look there... just before Furry Creek we see a stopped group with Denise changing her tire. She is now on her second one as she had a similar episode as I just had. Wanting to repay the kindness of those that just helped me, I helped Denise and we were quickly on out way. Devlin was now so far ahead that there was no catching him. At the Patco Road turn off to Horseshoe Bay we made the mistake of staying on the Upper Levels Highway and thus wouldn't meet up with Devlin at Gleneagles. Rochelle managed to contact him and we decided to meet instead at Marine Drive and 22nd Street at the Chevron gas station. That then was also our last stop before the end of the ride. All in all a great ride with a great bunch of people despite the little hiccups near the end. Thank you Denise, Devlin, Keith, Rochelle, Steve (+ friend), Shane, Mike, Paul, and Kacem for a great experience! In the end I got home just after 7:00 PM with enough time to shower, have a bite to eat, rest for a moment, and then head out with Esther to go see Roger Waters' "The Wall" at BC Place. Great concert and good times for sure! After the concert we went for a night cap to Jimmy's and by the time we got home I was so bagged that I don't even remember going to bed.